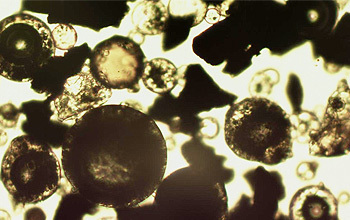 Silica-alumina microsphere is one of the components of the ash and slag wastes of the Thermal Power Stations, which are generated at coal combustion in the power plants boilers as a result of granulation of molten mineral matter of coal together with blowing of the fine drops atomized by inner gases. . In the result of this process hollow aluminosilicate microspheres of almost ideal spherical form are created. The diameter of particles is at average from 10-20 up to 500 microns, the pour density is about 0.4 g/cm3. 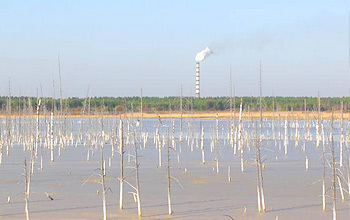 Together with the ash and slag wastes (ASW) through the system of the hydraulic ash-and-slag removal of the Thermal Power Stations the microspheres enter into the ash disposal area where ASW are divided into fractions. The light-weight ash-removal fraction, i.e. the microsphere comes to the surface forming a foam layer of thickness from few centimeters to several tens of centimeters, which drifts onto the water surface. The heavy-weight fractions settled onto the bottom. At the moment this material, possessing a range of unique characteristics, is in high demand. It is characterized by low density, high mechanical durability, chemical and thermal stability, low thermal conductivity. Due to all these factors microspheres are used as heat insulation materials, radiotransparent ceramics, fillers of composition materials, and special types of cement. Also, microspheres are perspective raw materials for getting accelerating agents, adsorbents, and encapsulating materials made on their basis and able to function in the conditions of influence of aggressive environment and high temperature. The main consumers of microspheres are enterprises of oil and gas production (plugging materials for boreholes, drilling fluids, crushing materials, explosives), manufacturers of insulation and heat insulation materials, refractory materials, manufacturers of mortars, construction materials and extra-light cements; manufacturers of paints, protective materials, roof coverings, sound insulating and heat insulating covers. microspheres are used as fillers at the production of plastic products, in car manufacturing (brake blocks, plastic materials, composites, tires, ground-coat paint).